The University of California, Riverside recently received $600,000 in research funding from the National Institutes of Health to support data-intensive research. These research topics are critical to the global human health and generate vast amounts of data, which increase the need for high performance computing. Over the past 50 years, data process instruments have grown into one of the most expensive research infrastructure investments due to the increasing size of data in many research areas. The data-intensive research within this grant will benefit high-throughput biology, drug discovery, and various other human health related disciplines. Currently, due to very high demand, the existing computing resources at the University of California, Riverside are operating at maximum capacity. The data overflow often results in delays in processing new research data in a time-efficient manner, which in turn slows down the discovery process of many projects. The money from the National Institutes of Health will be used for the purchase of a complex instrument: a Big Data cluster with high-performance CPU resources and data storage space equivalent to 5,000 modern laptops. With the new equipment the computation facility will be able to at least quadruple its current computing resources, which should greatly help resolve the shortage of Big Data computer resources and support many new research programs. The improvement in data-intensive research at the University of California, Riverside will benefit more than 160 researchers from more than 15 departments and is expected to attract more outstanding faculty for the research of many existing programs. UCR’ s research computing infrastructure is provided by a Central Bioinformatics Facility, which is part of the Institute of Integrative Genome Biology (IIGB). The Bioinformatics facility in IIGB was formed in 2003. In 2008 it became the largest high-performance research computuation facility at the University of California, Riverside. Each year UCR attracts $115 million in research funds, including $78.5 million in federal funds. The UCR School of Medicine will help Inland Southern California face a projected 53-percent shortage of physicians by 2015. In 2013 the University of California, Riverside received more than $15 million from the National Institutes of Health and more than $9 million as of July 2014. Total research expenditures at UCR are significantly concentrated in agricultural science, accounting for 53% of total research expenditures spent by the university each year. The 9th Annual BioResearch Product Faire™ Event on August 27th 2014 is the perfect opportunity for laboratory supply companies to network with academic researchers at the University of California, Riverside. In this event, laboratory supply companies will enjoy an engaged target audience and have an opportunity to deliver product samples and lectures to Riverside researchers. Biotechnology Calendar, Inc. has been producing on-campus trade shows for more than 20 years. Our well-known brand and strategic connections at top research universities mean that our audiences trust the vendors that we present and are open to their tools and solutions. If you are a laboratory supply company and would like to participate in the 9th Annual BioResearch Product Faire™ Event at University of California, Riverside on August 27th 2014, please click the button below for more information. 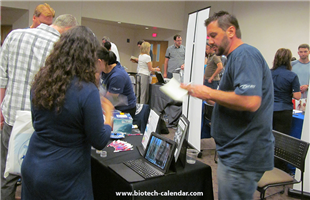 Biotechnology Calendar, Inc. is providing nearly 60 BioResearch Product Faire™ Events at different institutions across the nation. Please read the National Show Schedule for 2014.